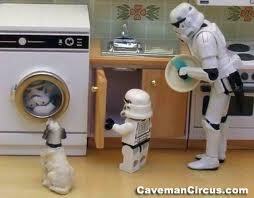 A Star Wars sequel: The Dryer Strikes Back? Leave me a caption or two in the comments. And if the door on your washer is hard to close, may the force be with you. Brainwashing 101: so easy a dog can do it! "Luke, I'm in your dryer" in a Darth Vader voice.